Kansas City area employment data has been a bit of a head scratcher the past couple of years. As the economy started to recover, the rest of the nation began to see real employment growth, but that growth seemed (according to the data) to miss Kansas City. The chart below shows the country (the yellow line) experienced modest year-over-year employment growth of about 1 percent starting in mid-2010. In the Kansas City area, however, data showed that employment was stagnant at best (the red line) and declined at a 1 percent clip during some periods. This decline seemed to run counter to other, more positive employment data we were seeing, like increases in help wanted ads, and decreasing unemployment rates. To assess current employment trends, we rely on data from the Current Employment Statistics — data the Bureau of Labor Statistics gathers from a monthly survey of approximately 486,000 worksites across the country. Once a year, BLS re-benchmarks the CES to reflect new data from the Quarterly Census of Employment and Wages (QCEW). The revised data (the blue line) now shows the Kansas City area economy has been recovering right along with the rest of the country, not lagging. The lesson to remember here is that initial local employment data is often revised — and sometimes those revisions can completely change our perceptions of how we’re doing. 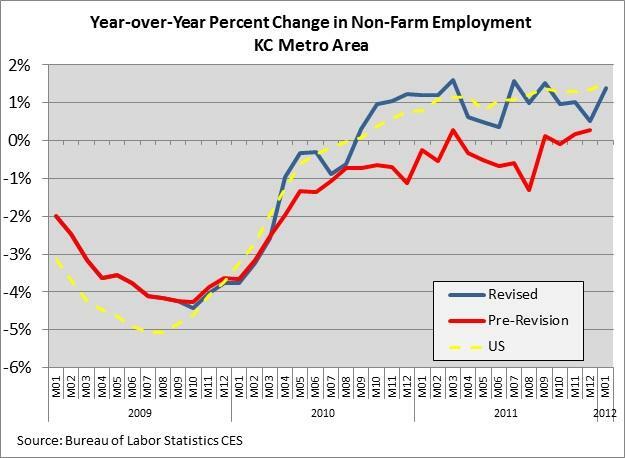 The new data solves what had been a big mystery for Kansas City area employment watchers. The early stages of the nation’s employment recovery did not pass us by after all. Instead, we’ve actually experienced real employment gains over the past year and a half. As always, we like to keep things in perspective. Even with these new and better numbers, metro-area employment is still down by more than 50,000 from its pre-recession peak. But we can be more confident that the region’s economic recovery is on track. The new data may tempt us to shout “We’re back,” but the truth is, we never really left.